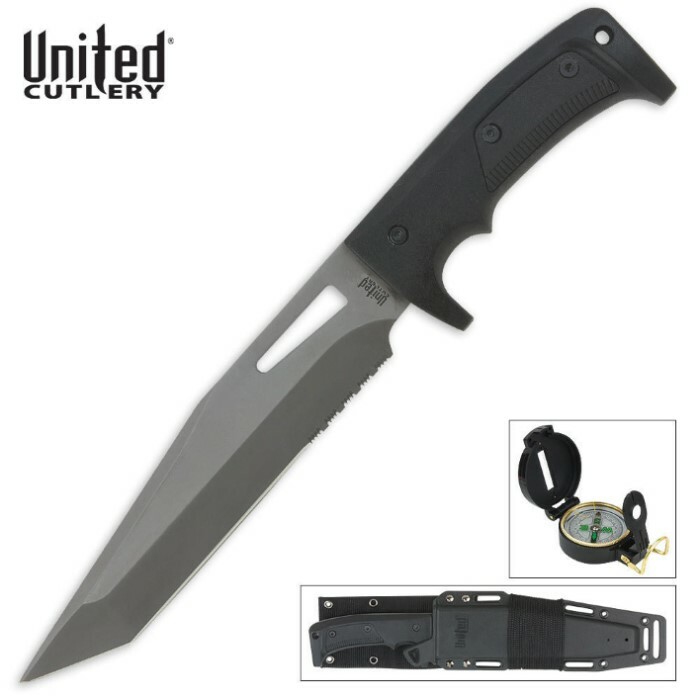 United Cutlery Pathfinder Tactical Knife & Sheath | BUDK.com - Knives & Swords At The Lowest Prices! 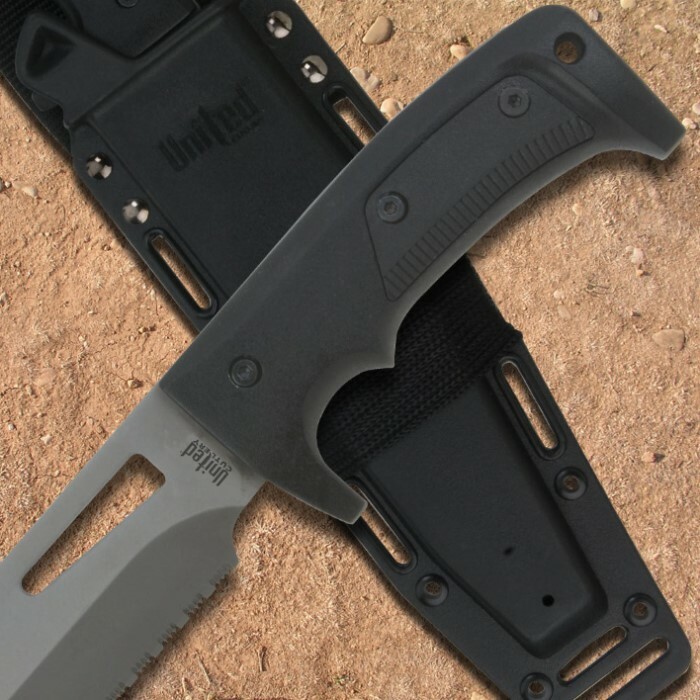 The Pathfinder Tactical knife & sheath set from United Cutlery is sure to help you find your way down any path. This fixed blade knife is constructed with an 8" 420 J2 stainless steel blade and a lightweight aluminum handle with black stainless steel hex screws, rubber inserts, and a hard coat finish. This is a great knife, heavy duty and fits your hand! The compass is first rate, this is a real value and bargain! The only drawback, is the molded holster takes a little getting used to in taking out and inserting the knife. But, would not hesitate to recommend this to family and friends! This Pathfinder Tactical Knife and sheath was surprisingly substantial. The blade was a lot thicker than expected and a pleasant surprise. I like the sheath that came with it. The only issue is the knife fits in the sheath very tight. It took a little effort to draw the knife out. But on the plus side you will not need to worry about the knife falling out. I highly recommend this knife. Great value! The picture on this page does not do justice to this knife. I ordered two for our survival packs and just received them yesterday. I was pleasantly surprised when I opened the box and noticed the quality of this knife! The blade is about 1/4" thick and full tang. The handle is machined aluminum with a durable powder coat finish, and attached to the blade with hex screws. The knife is fairly sharp out of the box and became razor sharp with little effort. The blade appears to be anodized, and has a nice flat finish that looks similar to Damascus Steel. The knife is hefty--but not TOO heavy, and works well for cutting brush and small trees for shelters or whatever. It also works well for splitting kindling or any other small chopping job, as well as slicing and whatever else you need. Well balanced, I believe it would work well for defense, as it spins in my hand to change grip almost effortlessly. I really like this knife and recommend it highly. Seems to me if this knife was manufactured by another brand that commands higher prices, it would easily cost two or three times the price. Thankfully United Cutlery charges a fair price for high quality gear! I have had this knife for over a year and it is my favorite go-to knife when I need my best. It needed a little sharpening as expected but I got it serious sharp and it's held that sharpness since. Sturdy, nice sheath with survival cordage. I've had some junk knives, this is definitely not one of them. One of the best buys for 19 bucks I have made yet. Later, I bought several for friends. They were equally impressed. I would recommend this value to anyone. Picture doesn't cut it! When I got the knife out the box "wow" was all I could say for 5 minutes!!!! HEAVY, THICK blade 95+% full tang. >love the style blade and angle of the 3 point tanto. Plastic handle was a lil disappointing but didn't affect the overall awesomeness of the knife. Sheath is nice! Great design and fit. And love the locking mechanism for the blade. Not velcro, or button. But a tension latch is best I can describe. United Cutlery is among my favorite companies. Never had any problems with their blades or prices. Love you guys! And thank you BudK! P.S. for those who complain about knives being dull: If you can't sharpen a knife, then you need to find another hobby! This is not for you!!!!!!!!!!!!!!!!!!! A great knife at a great price. Thick blade ,sharp ,and it came oiled ! The sheath is good a heck of a lot beater than others. I have been collecting knives for nearly 20 years and when I ordered this knife, I wasn't sure what I was going to get. When I opened the box, my jaw hit the floor! The weight alone is substantial and is easily manageable in any situation. It's definitely big and tough enough to take down small trees without much effort and will stick a hog for an instant kill. The only problem I found with this is the sheath.. while not a "problem" really, more an inconvenience.. it takes a bit of effort to pull the knife out! I love the fact that the knife slides in smoothly and locks into place without having a button snap or velcro to content with.. but removing it smoothly will take some practice and you may need to shave off some of the plastic as it can be a bit sharp around the edges. Really the only other thing that I would say is a negative is the belt loop on the sheath.. it's pretty flimsy to say the least and I'd prefer the whole sheath to be of the same plastic material, one solid unit. The compass.. meh.. it's a cheapo compass that won't hold it's accuracy because of the air bubbles in it, but is ok for short distances. A proper and accurate compass should have no air pockets of any type inside the bezel. Overall.. I love it and I'm buying another one for my round trip trek on the Appalachian Trail in 2015! Editor's Note: Thank you for your comments. We have removed a portion of the review which does not comply with our review guidelines. More knife than I expected! Big, Tough, Solid. Great sheath. Although, way too much oil all in the sheath. Very poor edge from factory, but I can remedy that. Still just a great knife for camping and for the price I have not reservations playing with it. It's a keeper.